It’s been a bit hard to focus on writing this blog post this week, but no matter what happens with Occupy Oakland, the mail in election will still continue happening and votes will be cast, so I thought it was important to share my endorsements. This election is solely vote by mail, which means you cannot vote at your regular polling place on election day. The deadline for mailing your ballot is not the usual election day (the 2nd Tuesday of November) – it’s on November 15th. 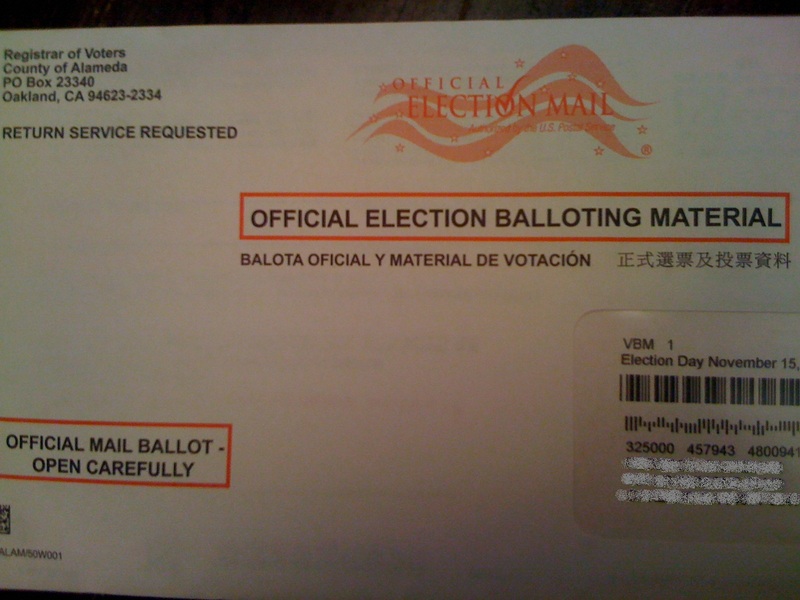 Your ballot must be received by November 15th so to be safe, I would mail it in several days before that deadline. You can also walk your ballot into the Registrar of Voters Office anytime until 5pm on Tuesday, November 15th. And now, to the endorsements. I apologize that I didn’t write more in my own words. I could write plenty about each of these measures, but I’m incredibly exhausted today, as it’s been difficult to sleep when I’ve fallen asleep and woken up to helicopters several days in a row. So the words of others will have to suffice for now. Measure H – No, No, No! This measure would change Oakland’s city attorney position from an elected one to an appointed one. If Measure H passes, it would give the City Council the authority to appoint someone to be city attorney and to remove him/her at their will. The Oakland Tribune calls this measure the “John Russo ordinance,” which is apt as it stems from the clashes the Council and Mayor had with Russo over his legal opinions when he was city attorney. The last thing the public needs in the office is a political crony who will rubber stamp council policies. Supporters argue that only 2.5 percent of California cities have elected city attorneys. That may be true. However, in 80 percent of cities Oakland’s size and larger, the voters choose the city attorney. The council appointed Russo’s deputy, Barbara Parker, to complete the remainder of his term, which expires in December 2012. After that, residents should elect the next city attorney. As we have previously stated previously, voters should not tolerate this naked power grab. Up until this Tuesday, I was still undecided on Measure I, the parcel tax. I’ve never been so torn on a ballot initiative. Actually, except when I didn’t understand a measure, I can’t remember ever taking more than a week to figure out my position. I’ve also voted yes on every parcel tax that’s ever been on the ballot. I firmly believe that our government needs sufficient revenue to continue providing services to our community. But for the past couple of months I’ve been debating myself over whether this parcel tax makes sense or not. And if I had written this blog post as planned on Tuesday morning, I would have issued a “no position” endorsement on this measure because I still didn’t know how I would be voting. But the police reaction to Occupy Oakland on Tuesday refocused me and made me think deeply about the future of our city. As I lay in bed Tuesday night, listening to helicopters overhead, I realized that a no vote on Measure I is the best vote for Oakland’s future. My reasoning might not be what you expect. I still believe that our city will at some point need more revenue, and this parcel tax, which generates just $11 million per year is a band-aid solution that could hire us a few more police officers and other employees. In the long-term though, it won’t be worth it because if this measure passes and the city still fails to provide adequate services to its residents (which I think is what will happen), voters will be very unlikely to approve future taxes, ones that could be much better planned and effective than this one. Oakland voters have already soured on parcel taxes, voting the last two down. At this point, the Mayor and the Council need to focus on better managing the city and its budget, which could prove to the voters that they would manage parcel tax revenues wisely. If you’re fiscally conservative, voting no on this is obvious, but if you’re progressive, voting no is still the right thing to do if you ever hope for Oakland voters to approve future parcel taxes that are better defined and produce enough revenue to have a significant impact on the services the City is able to provide. Measure J would allow the full-funding deadline of 2026 to be changed if both the PFRS Board and the City approve, and if the new deadline is based on and supported by an actuarial study commissioned by the board. This would not change the city’s obligation, but could allow the city to lessen its yearly payments by spreading them out past 2026. Beginning ten years from the full-funding deadline, Measure J also requires the PFRS Board to amortize each year’s gains and losses to protect the city from market volatility. Such smoothing, as it is called, would not change the overall payment obligation, but would help the city avoid large changes in annual payments from year to year. Like many cities, Oakland’s mounting pension costs and unfunded liabilities are threatening our ability to deliver the most basic city services. Past commitments to generous pensions for retired city workers are overwhelming our ability to pay them and still fund current services like police, fire, public works, libraries and parks. California law severely limits the city’s ability to change these costs and prohibits us from modifying any past commitments. Oakland’s Police and Fire Retirement System — PFRS — has been closed to new hires since 1976, but still pays benefits to about 1,000 retirees. Because this retirement account is not fully funded, the city must pay the PFRS fund almost $46 million every year until 2026. Measure J would reduce the strain on Oakland’s budget by trimming $4 million from the annual $46 million payment, in exchange for a modest deadline extension of two years. Extending the PFRS deadline would not increase or extend any taxes or add any debt to the budget. This modest adjustment would reduce the strain of Oakland’s annual pension payments by $4 million a year, enabling us to redirect that funding toward pressing matters like hiring more police. If you’re looking for factual information about these measures, I recommend reading the Oakland League of Women Voters’ pros and cons. And please feel free to agree, disagree or ask questions in the comments, but I ask that you be respectful as some of the discussion about the initiatives I’ve seen on other websites have been filled with attacks. Sadly, I already cast my ballot. I want my vote on I back 😦 Tuesday was indeed a watershed. Yeah, too late to get your vote back. But I’m sure you have friends, family or colleagues who haven’t voted and who are looking for advice on how to vote. Reach out to them! Becks, if you took a week to make up your mind on I, you should have taken 4 weeks like i did to decide on J because it is much more subtle and complex. I’m sorry you based your based your decision on the superficial op-eds by Libby and MOBN. The Tribune analysis that came out NO on I had much more analysis backing up the conclusion. Any time so called pension reform legislation is bankrolled by the very same muni unions that have the greatest economic stake in preventing reform, you should assume guilty until proven innocent. SEIU and Firefighters pac’s paid for Libby’s flyer. Big red flag that you ignored or perhaps embraced? Many of the opponents of I, eg. the Greens, took “No position on J” because they didn’t have 4 weeks to figure it out and cut thru Libby Schaaf’s fog. I doubt if Ms Schaaf really understood what she proposed. On the other hand, at least they didn’t give the benefit of the doubt as you did to the very unions whose pensions we will be reforming over the next few years or go bankrupt. I took months to make up my mind on Measure I, not one week! For J, it took me a while to fully understand it, but once I did, I quickly decided to support it, long before the op-ed was published. As I wrote above, I would have liked to include more of my own arguments in this blog post (especially for H), but I’m totally exhausted after this week and just needed to post my endorsements already. Like Libby S and mobn op-ed pieces., no mention from you of J’s shifting an already ridiculous amount of the PFRS burden to young residents. Do you disagree that it does that, or do you feel it’s ok to do that for some reason? Don’t you find it curious that unions like SEIU and Firefighters would support something labeled “pension reform” that consists entirely of delaying funding? Do you think it’s just some altruistic motive of the unions? My view is that those particular unions are much more saavy than some of the other unions and certainly have staff more knowledgeable about the scary state of Oakland’s finances than Oakland’s :Council members and Mayor. Heck, Quan fired some of the best and brightest in the budget dept. There is still no published short or long term budget. that’s wierd. Those unions probably agree with the Trib that Oakland’s finances are so scary bad but rather than encourage funding solutions, their response is to decrease and delay funding to push out in time that risk of bankruptcy. What’s even worse to the unions is the risk that the residents vote to outsource the union jobs if the unions don’t give back vested benefits. Say it will never happen here, the way it already has happened in nearby cities. Tune back in a few years when we have to choose between paying union pensions and benefits or libraries, parks, cops and schools. Thanks for this. I’m still undecided on J and I’ve been too distracted by this week’s other events to sit down and look hard at the arguments for and against. It’s tempting to send a message to the council that they can’t keep kicking the can down the road every time they encounter fiscal difficulties, but on the other hand I generally think that sending “messages” with one’s vote is a silly thing to do. Dave C, did you read the Tribune’s lengthy editorial opposing I and J ? Very detailed and data driven reasons why J is bad policy. The treatment of Dave Mix who wrote the rebuttal of J is an example of how the residents who speak up and tell the pols that their financial decisions are stupid, get buried under a flurry of soothing op-ed pieces and endorsements by “reasonable” named people and orgs. 10 years ago another Dave, a local cpa, stood up at CC meetings at the time of Raiders deal and called the council’s financial projects bs. He only got ridiculed. I talked to him the other day to ask his help on defeating Measure J. He laughed and said he learned his lesson and isn’t fighting any more. clarification: the Dave, cpa who spoke up against the :Raider’s deal, was a different Dave from the Dave who wrote the election booklet rebuttal against J. Re. J, another reason to vote No on J, is simply that there is no reason to rush this thru now. It’s not as if it fails, that Oakland has to come up with 45Mill more immediately than it would have otherwise. At best, it would be a no interest loan of 3 or 4 million bucks per year that had to be paid back. (at worst, it’s much worse than that). We should vote No on J and then tell our council members via email and in person, that we want the Council to come up with a comprehensive, sustainable long term financial plan for an optimistic, a likely, and a pessimistic set of scenarios for the next ten years or so, that includes all retirement obligations. if they can’t come up with a viable long range plan we better find that out now rather than in the year 2026. Dave C, one lesson that many financial professionals and maybe some local government officials learned from the economic events of the last years is that if you don’t fully understand a financial transaction/investment, don’t do it. if you don’t completely feel comfortable with Measure J, the best thing to do is to vote no. if it’s really the free lunch that Ms Schaaf and MOBN has convinced Becks that it is, let its supporters fully answer the critics of it. is what real pension reform looks like compared to Councilmember Schaaf’s phony pension reform. I don’t know if it would help us reduce our huge under and unfunded retirement baby boomer soon to retire obligations because it seems to be primarily a “two tier” reform that only affects new hires. Would apply to state and local pension plans. 3. pension wb mix of a 401k and the current fixed benefit plan. Ie. some of the risk of investment losses would be born by employee as in private industry. 4. pension wb based on average of last 3 years wages, not last year. A vote for Measure J is the height of selfishness.